Specialised Structures are proud as punch to hear back from our many customers who have taken the time to write and thank us for the building projects we have completed for them. Your feedback is important to us and our reputation as a leading construction company in New Zealand. A great ethical company NZ owned with the strongest sheds in the marketplace. Our building suits our business, our style, compliments our products and most importantly attracts customers. We are very pleased with the repair work. Luke Anderson, the contractor, did an excellent job. All the debris, nails, screws, iron etc. had been cleaned up and taken away. We would recommend Specialised Structures for any building/repair work. A job well done! 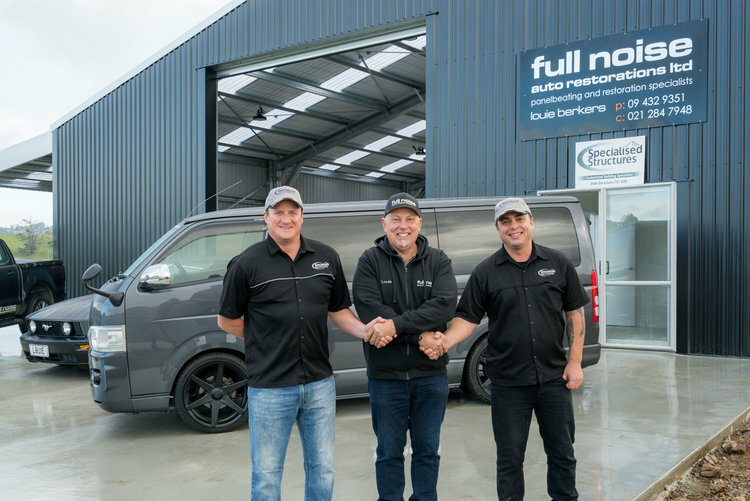 We have been operating our panel beating and restoration business, Full Noise Auto Restorations Ltd, in Port Marsden Park, Ruakaka for nearly 4 years now. We have experienced huge growth in this time so we decided last year to expand our operation. We purchased a neighbouring section and started the process of choosing a shed company to supply our new workshop. I first met Mark Wells from Specialised Structures through our business and was instantly impressed with his attitude and confidence. We started working through the process of getting several quotes to supply the kit set of our new workshop and Mark was one of the companies we chose to price that. After we went through the all of the quotes and weighed everything up we decided on Specialised Structures to supply the kit set for our new building. They were not only very competitive, but also had a great attitude towards the build. We have been very impressed with not only Mark and Darin and their awesome customer service, but also the quality and strength of the shed itself. We are very happy we chose Specialised Structures for our new workshop and have really enjoyed the whole journey with them. We would like to thank them for their hard work and awesome attitude we experienced from them throughout the build and would not hesitate in recommending them to anyone who is looking to build in the future. Specialised Structures designed and built a storage barn/garage at Lake Hawea for Beker’s Motorcycle Tours NZ Ltd. The original concept was for the overflow of motorcycles and other accessories for the touring business. Specialised Structures then added in the habitable part of the garage so it could be used as either a holiday home or office. So making this barn/building a perfect multi-purpose building. Our fantastic new temperature controlled extension means we can keep even more products in stock as well as in perfect condition. Thanks to Lance and the Tasman team from Specialised Structures for your hard work! In November 2011 you constructed a purpose built 10 X 8 boat storage shed to house the 7 metre Stabicraft boat and trailer as well as the towing vehicle and ancillary equipment. Design detail was important due to the overall length and height requirements as well as door access from both ends. Construction was completed on time and met all our requirements. The finished product is a credit to the construction team, management and staff of your office, who has been a pleasure to work with. Importantly costs were controlled within quotes. We would not hesitate to recommend your company to any future customers. I purchased a shed (9.0m x 7.5m) from the Invercargill branch. From the initial design stage right through to the construction of the shed, I found the whole process was hassle free and there were no unexpected cost over-runs. Before deciding, I had looked at other brands and designs but decided to go with your company because in my opinion you offered a better quality product at a competitive price. I am very pleased with my shed and would recommend the whole team at the Invercargill branch for anyone considering completing a similar project. I got Specialised Structures to design our factory building to suit my needs, and all council consents went through without question. I bought the kit from Specialised Structures, and used local builders Keating Construction, who had never erected a steel shed, another local concrete man, Andrew Carey did the floor. Prestige Roofing Matamata did the Cladding. Tom Keating found the instructions simple to follow and everything went up without a hitch. So my thoughts are nothing but positive, the Specialised Structures kitset sheds system works simply and well. Specialised Structures NZ Ltd were a pleasure to work with!